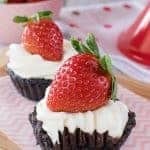 Easy no bake desserts are always a quick and easy treat to make up. These easy no bake Banana Cream Pies in a jar make the perfect end to any dinner. Did you know that today was Pi Day? March 14th = 3/14 = 3.14 Yeah, that’s kind of losing me too. I only know because I have friends who freak about all things math. Me? I just freak because it is another day to celebrate with a dessert. Pi Day to me means PIE DAY for the BruCrew!!! 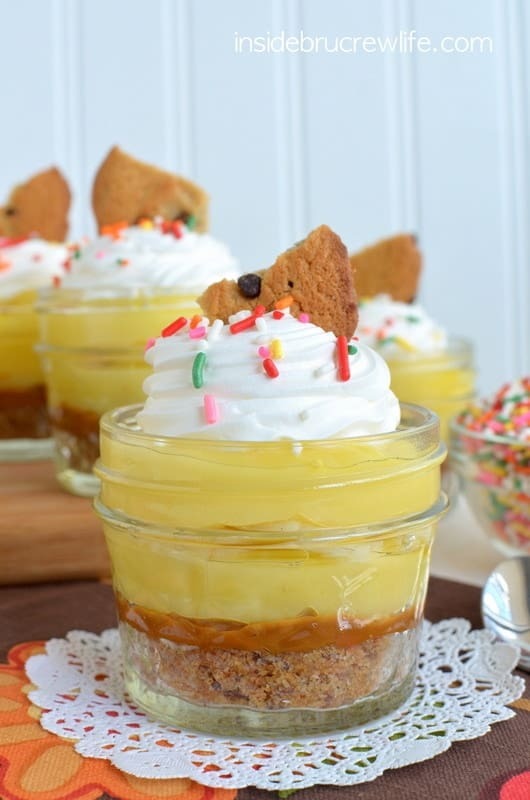 These cute little Banana Cream Pies in a Jar are waiting for us to enjoy after dinner tonight. , and had the crust in the jars in under 5 minutes. Top with some instant banana cream pudding and real banana chunks and viola! Dessert is done. Go ahead and top with some Cool Whip and sprinkles and chunks of leftover cookies for a fun and spectacular presentation. Want to know another secret? You could totally change out the pudding to another flavor if banana flavored desserts are not your thing. 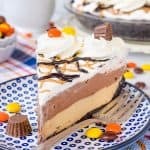 I’m thinking chocolate pudding with the caramel and cookie crust would totally rock my world too! Cookies and caramel make a delicious crust for these easy no bake Banana Cream Pies. They are the perfect treat for any picnic or party or after dinner. Combine the cookie crumbs and melted butter in a bowl. Divide into 8 small glasses or jars. Press down firmly in the bottom of the jars. Set aside. Combine the pudding mix and milk. Whisk for 2 minutes. Let set up in the refrigerator for about 5 minutes. Spoon the Dulce de Leche in a bowl and microwave 30-60 seconds. Spoon a tablespoon into each jar covering the crust. Spoon a large spoonful of pudding on top of the caramel. Next add a few banana slices to each jar. Cover with the rest of the pudding. Refrigerate until serving. If you can't find Dulce de Leche, you could substitute any thick caramel ice cream topping. Want more Pie Day options? 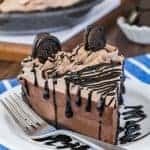 It’s a Pie Day party over at Crazy for Crust…make sure you head over there and see all the fun pies that are being shared. *This post contains an affiliate link. Thank you for letting me share the products we know and use and for supporting Inside BruCrew Life this way. Happy Pi Day to you! I think that I will make this today ! I hope you tried these fun puddings. So easy and fast to have on the table!!! 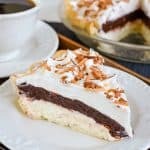 I’m drooling over the Banana Split Brownie Pie! It looks amazing. My kids are still reminding me of my mistakes and they are in their 30’s! They never forget! Have a great PI Day. haha good to know!!! I’m pretty sure my son will NEVER let me live this down. I am LOVING this banana cream kick you’re on! So tasty and perfect for spring 🙂 these pies are WAY cute and I wouldn’t mind celebrating Pi Day with an infinite amount of these cuties!! Thanks! They are so easy to do…just throw them together and dessert in jars for the week! Power to the banana desserts! I love that we both posted banana pudding pies…I can’t wait to check out yours!!! MMM these look so fun! And a cookie crust!! YUM!! The cookie crust just gave it that little edge over all the other ones 🙂 Plus I like to eat choc chip cookies whenever I can!!! LOVE! These are so cute! I’m so running out to buy myself some jars! These little pies are wonderful-easy, quick and already portion controlled! Yes, get some jars! I use mine all the time. In fact I have a huge tub of all the different sizes just in case I need some!!! Thank you so much Ruthie!!! I love these Jocelyn! You know my weakness for food in jars. And dulce de leche under the pudding? LOVE! Your math story made me chuckle. We’re in 2nd grade now and I cannot do the grammar. AT ALL. Math is totally lost one me, partially because I never payed attention to the teacher and instead at the hot soccer player in front of me. He was more fun to think about it. Moving on, these no bake banana cream pies are darling. The cookie crust has me hooked. Cute soccer players are definitely more interesting than math! The cookie crust was such a fun touch!!! I love pie in jars… looks delicious! Oh girl, these look awesome. Love cute little jars of pie! Good warning on the dulce de leche cause I totally have been known to eat spoonfuls. YUM. I should never have taken that first bite…I’m officially hooked!!! I like the way you think! I used fat free milk in mine to help cut some of the fat! Math is not my strong suit either, but any day is great to have more Pie! I am obsessed with anything in a jar!! I agree…every day is better to have PIE on!!! Something about a cute dessert in a jar gets me every single time!!! 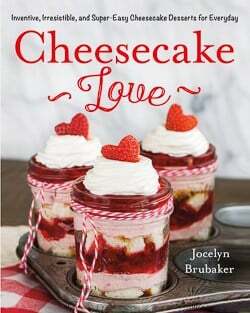 We love desserts in jars! 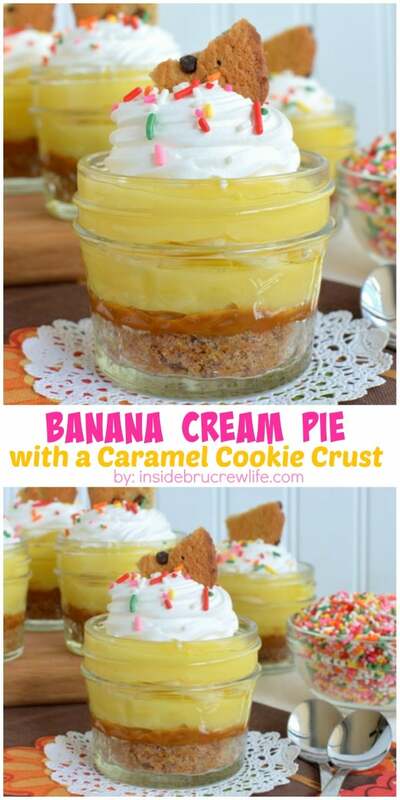 These banana cream pies are not only adorable but need to happen in my kitchen ASAP! So fun! 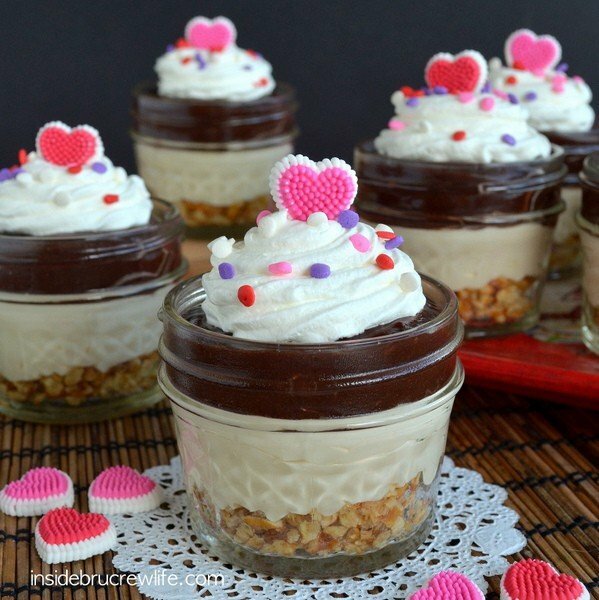 Easy banana desserts in jars…such a fun treat to be in your kitchen!!! Hooray for 10 minute desserts 🙂 Gotta love those kind of baking days!! I love desserts in jars-so cute. Especially pie! I sort of loathe math lol so I completely forgot about pi day once I left high school. 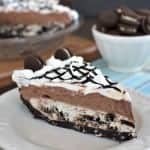 BUT if they served me this pie on pi day MAYBEEEEE I would’ve paid more attention in class 😉 I love how simple this is to whip up – and it’d be awesome around Easter! I only know about school holidays because of my crazy math obsessed friends (whom I adore)! PIE in school would totally help me remember these kind of days!!! 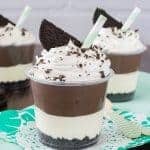 You are right…these are such a perfect summer time dessert to cool off with!!! Hello! Beautiful blog and great recipes! I found you thru Six Sisters’ Stuff blog hop. Yum! 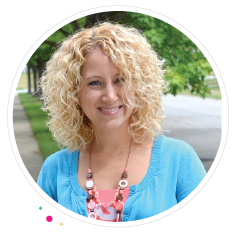 This looks really good and I love that it is quick and easy:) Thanks for sharing! I hope you have a wonderful weekend! Awe thank you so much Winnie!!! Oh, this looks so good! I love banana cream desserts! hahaha! You are too cute!!!! 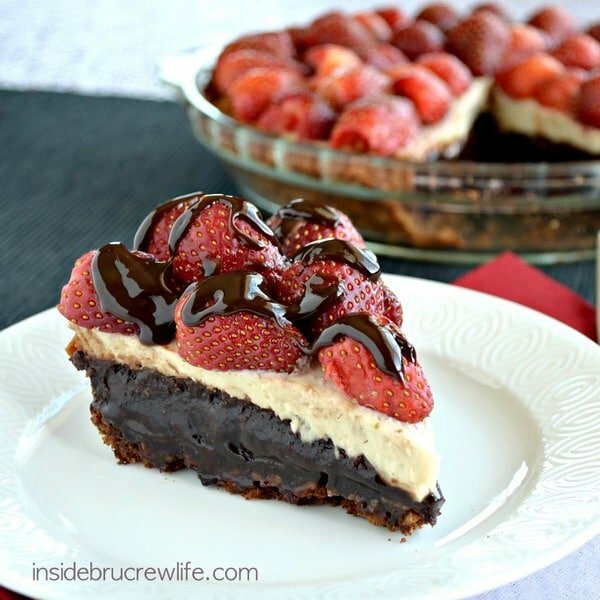 Yay for no bake dessert! 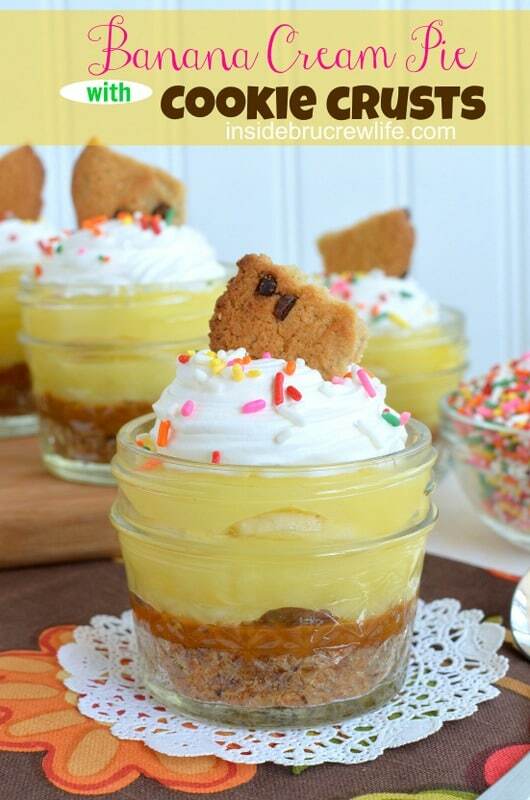 Banana Cream Pies always my Hubbies fav and the jars make it super cute! Adorable!